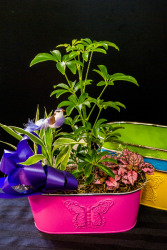 Let Mother's Day last all year long with this selection of tropical house plants in a colourful planter box. A perfect gift for the Mom with a green thumb! Some say "old fashioned", but we say classic! We love the tradition of a Mother's Day corsage, so why not adorn Mom in flowers on her special day? Shown in white, but colours may vary. 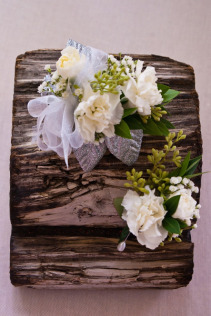 (Larger corsage in picture is $30, small is $20) These are pin-on style corsages. SOLD OUT!!! 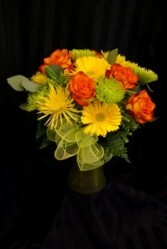 A gorgeous citrus vase with a delightful mixture of roses, Gerbera daisies and anastasia. 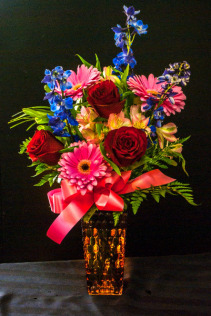 Sure to make Mom smile. SOLD OUT!! 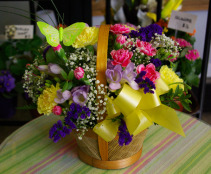 How about a colourful garden basket arrangement for Mom? She'll love the vibrant colours and the long-lasting, fragrant flowers in this beautiful arrangement, with a bright bow and butterfly to top it off! 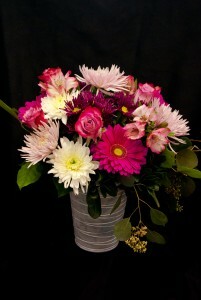 A beautiful mixed floral design in a rustic white-washed tin container. Perfect to help Mom celebrate her day! 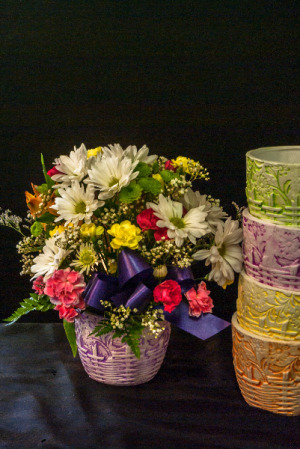 A lovely English garden posie in a pastel ceramic pot with a basket weave look. 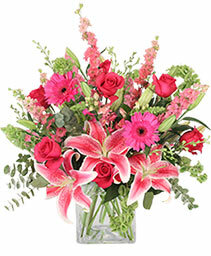 A great addition to any Mother's Day! SOLD OUT!! 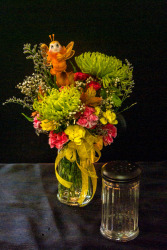 How about something a little more permanent for Mom? 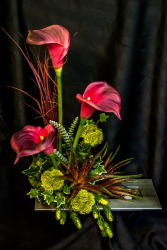 This beautiful silk high style arrangement is perfect. Purple calla lilies and vibrant succulents in a modern tin container... it's just the right gift for all the contemporary Moms out there. 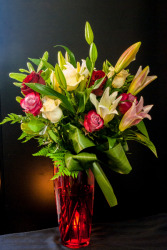 Mixed lilies and rose with lush greens in a ruby red vase - pure elegance. 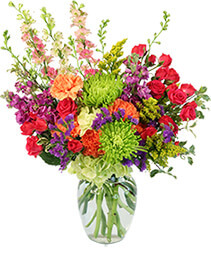 This classic arrangement will be sure to make Mom feel like the most important person in the world! 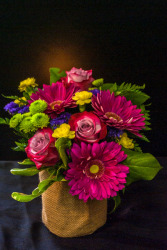 Primary colours make this arrangement pop! 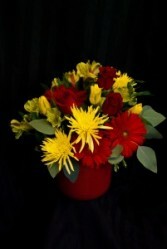 Make Mom smile with bright reds and yellows in this lovely red ceramic orchid pot. 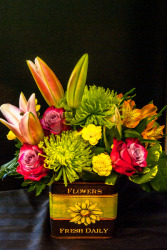 A bright, mixed arrangement of lilies, roses, anastasia, carnations and alstromeria with lush greens in a fetching ceramic cube vase is a perfect gift for the Mom that loves flowers! SOLD OUT!! 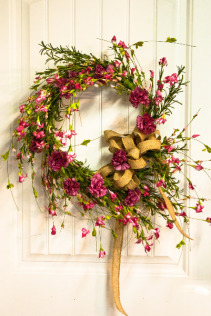 This lovely 22" pink carnation and wildflower wreath, complete with a burlap bow, would look beautiful on any door. Happy Mother's Day, Mom, all summer long! SOLD OUT !!!!! A fun and bright mixed arrangement is sure to brighten Mom's day! Colourful gerberas, assorted carnations, vibrant roses, and rich greens all in a lovely tinted glass vase. SOLD OUT!!! This beautiful 22" silk lilac and twig wreath is reminiscent of an English garden. 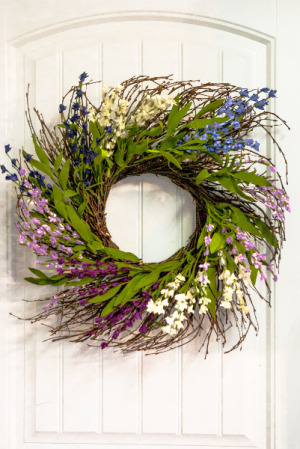 It would look lovely on any door! 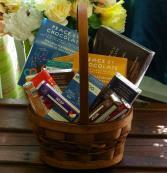 A great Mother's Day gift.